The goal of this widely used book is to present in a highly illustrated format the principles of design for good hearing and freedom from noise in and around buildings. The more than 540 illustrations are not merely supplements to the text as with nearly all traditional books. In this book, the illustrations are the core of the coverage of basic principles of sound and hearing, sound absorption and noise reduction, sound isolation and criteria for noise, control of HVAC systems noise and vibrations, auditorium acoustics design, and electronic sound systems. The book is written for architects, interior designers, engineers, and all others concerned with the design and construction of buildings who need to know the basics of architectural acoustics, but who do not have the time to digest wordy presentations. Designers who understand the basic principles of acoustics will possess an important new tool for shaping the built environment. 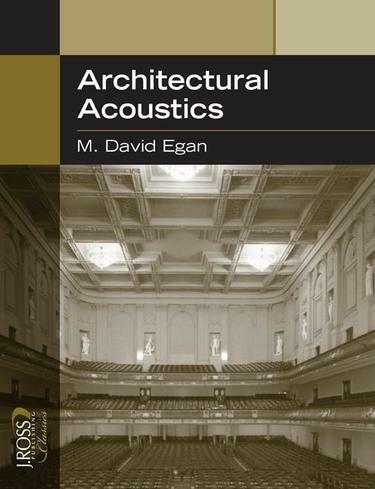 Hopefully, not only better acoustical environments, but also better buildings should result.An unabridged J. Ross Publishing republication of the edition published by McGraw-Hill, New York, 1988, 448pp.